The night before last I had dinner with Karel van Wolferen at the Foreign Correspondents' Club of Japan. This was a very appropriate place to meet. Karel van Wolferen is the author of The Enigma of Japanese Power. Although it was written in 1990, it remains one of the best books in understanding the way the Japanese government works. I recommended this book in addition to Alex Kerr's Dogs and Demons as two essential books in understanding the dilemma the Japanese face today. Karel said that, in a way, Dogs and Demons is a followup book to The Engima of Japanese Power. We both agreed that Japan has changed a great deal since he wrote the book, but that most of the basic arguments in his book are still valid today. Japan still lacks one of the fundamental requirements of a healthy government - political accountability. We both agreed that people don't understand how the Japanese system works, including the Japanese. 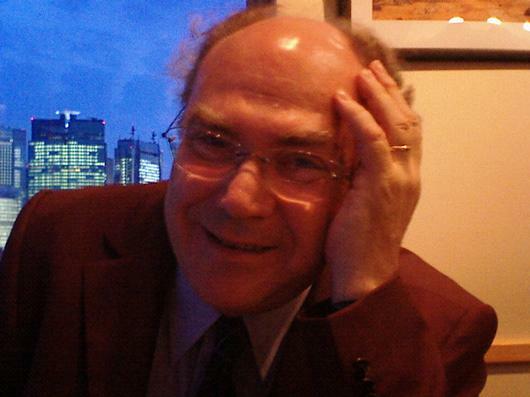 Although Karel is a professor at the University of Amsterdam, he spends a great deal of time in Japan, writing for various publications, debating Japanese politicians and working very hard to try to help Japan. He had read some things that I had written and I was happy to have Karel say I was a "kindred spirit." We talked about the Internet and Wikipedia and how facts and history are being collectively created online. One interesting problem that he has is that many people spell his name as "von Wolferen" instead of "van Wolferen". Even editors of major newspapers consistently "correct" the spelling and change it to "von". It has gotten so bad that there are more results for the wrong spelling than the correct one on Google. It's funny to imagine people who are so sure of their spelling that they would change the spelling of someone's name without checking. We promised to keep in touch and try to collaborate in the future. So where is his blog?? He should have one. I read that book a couple of years ago. I thought his main points were very interesting...especially when he talks about the university system, it was pretty much in line with my own direct observations of my friends at Waseda. But some of the things he had to say about Japanese people as a whole was at times a little to ethnocentric for my taste. I wish I had it with me now that I could reference exactly what bothered me. So that book is kind of mixed bag for me. "We both agreed that people don't understand how the Japanese system works, including the Japanese." Yeah, well, the very same argument - and it would be an accurate one - can be made for most countries and how their own government's operate, including ZOG, USA. The majority of people everywhere don't even have a clue. If they did, there would be a worldwide revolution. I found Kerr's dogs and demons very insightful and sometimes scary in the use of detail. In fact I remember putting it down after the 7th chapter because it was a little too much criticism. it's "VAN" as in "van Wolferen", just like Joi wrote in the entry above. "It's funny to imagine people who are so sure of their spelling that they would change the spelling of someone's name without checking." I get this all the time: Quartermaine? They're thinking of Alan Quartermaine, as in H. Rider Haggard or General Hospital. Often they have trouble pronouncing it any other way, even after they realize it's different. I just tell them no, they're thinking of my cousin once removed by fiction; they laugh and usually get it right after that. For that matter, I always used to think your name was spelled Joey, because I heard it from Jefu and only saw it written later. I think this is related to your thought about missed opportunities for Japan. The powers that be in various countries (esp. US and JP) all just knew that communism was the main threat, so they respelled everything that didn't fit that preconception. After all, why would anyone want to be anything but anti-communist, or nowadays anti-terrorist, excuse me, anti-tyranny? People live more by their hindbrains than by their prefrontal cortex. Joi Ito - "Dinner with Karel van Wolferen" by Joi Ito is licensed under a Creative Commons Attribution 4.0 International License.